The Post is in part a rumination on the importance of a free press as told through the prism of a particular and defining moment in America’s history. It’s also a story about the people who explore and define their relationships with each other and their role in history while living through the chaos, uncertainty and urgency of that moment. It serves as a reminder of the importance of a dedicated, truth-driven free press in a functioning democracy, and how the doubt, questions, and second-guessing of what the right thing to do is a healthy, important part of that role. A leak of classified ‘Pentagon’ papers that chronicle the damning history of disinformation about America’s role in the Vietnam War spanning multiple administrations, triggers an historic moment in the history of the United States of America. These Pentagon Papers, commissioned by Robert S. McNamara (Bruce Greenwood) during his service as Secretary of Defense in the Kennedy and Johnson administrations, were handed over to The New York Times by Daniel Ellsberg (Matthew Rhys). Ellsberg, a senior research associate and former military analyst who had contributed to the classified materials, had become disaffected by war and the lies being told about America’s role in it. When the Times published the first story about what the papers revealed, ripples were felt through Washington, including at The Washington Post, where the new owner, Kay Graham, (Meryl Streep) and Editor Ben Bradlee (Tom Hanks), scrambled to find a way in to the story. A defining moment in the freedom of the press and its role in a thriving democracy is born when The Times is prohibited by court order from any further publications. The Post, with recent access to the same classified materials, finding itself at a crossroads, must decide whether to risk everything and publish what they have. Steven Spielberg brings to bear his storytelling gifts, neatly crafting a compelling film with urgency and suspense that, even for those of us familiar with the details and eventual outcome, delivers a thrilling and gripping narrative. His approach to the conversation-heavy material is to keep the camera moving, heightening the sense of fluidity and uncertainty of this moment in history. The second-guessing, doubts, and apprehension the Post newsroom, owner, and board members feel as they grapple with the risks and implications, is supported by this movement. It’s impressive and subtle. The Post is a terrific examination of how reporters approach their stories and how newsrooms brace their reporters. Sure, we’ve seen films like The Post before. All The President’s Men is perhaps the pinnacle, covering the next piece of this story that The Post dangles as it closes. Other films, like 2016’s Spotlight, offer a fascinating examination of how a story is unearthed, and how there is often a scrappy fight to pursue a story despite political and business pressures. 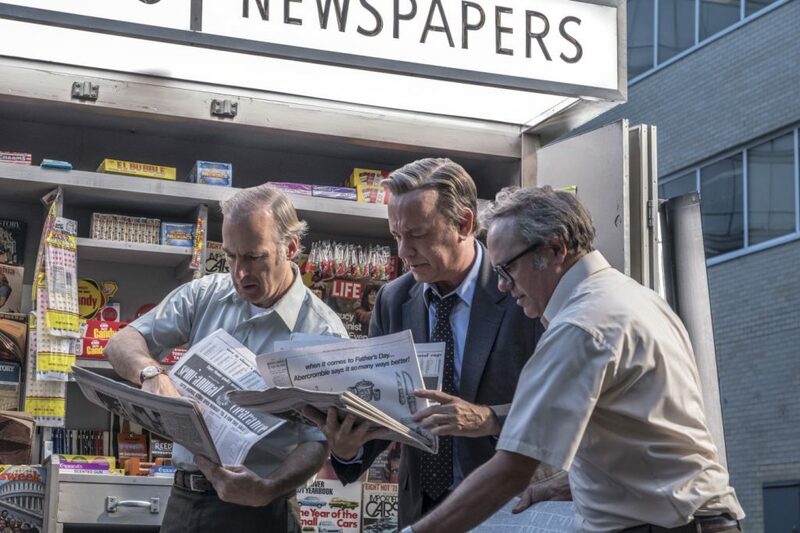 The Post is more tightly focused, and isn’t so much a mystery-thriller or straight drama, offering more a character examination of people in extraordinary times unwittingly battling to protect the vital role and function of the free press. From the decision to make The Post, to release day, was an impossibly fast production. In an era where the veracity of the free press is under assault, Spielberg managed to assemble a top-class cast and bring recreate a believable Nixon-era United States. The timing of telling this story is a part of the story, frankly. The iron is still hot in this particular conversation, so striking as quickly as possible was important. Dramatically, it succeeds, with wonderful performances. Meryl Streep is fascinating to watch as Kay Graham, owner of The Washington Post following her husband’s death. She delivers an honest portrait of a person unsure of her power position, but never shying from what it demands of her. Every inch of Streep becomes Graham, from nervous body movements and awkwardness in meetings, to a seeming lack of confidence in her conversations with board members and others (except Ben Bradlee, with whom she has developed a trusting relationship). What works so importantly about her performance is the relatable doubt followed by the conviction with which she makes decisions after all the handwringing has passed. Tom Hanks turns in another fine performance as the driven, understandably ego-heavy newsroom editor. His interactions with Streep’s Graham produce some of the films best scenes, and watching two greats perform under the direction of one of cinema’s legends is a gift. There’s a much broader cast here to be celebrated as well. Bruce Greenwood’s McNamara is sympathetic, Bob Odenkirk is absorbing as Post reporter Ben Bagdikian, Sarah Paulson’s brief appearance as Tony Bradlee, Ben’s wife, is warm and likeable, and Bradley Whitford (Paulson’s co-star in the short-lived but excellent Studio 60 on the Sunset Strip), is terrific as Arthur Parsons, a foil to what ultimately became the right thing. It’s important to recognize that Parsons could easily have been right in his assertions of consequences to the paper. Every other performance, from David Cross’s Howard Simons to Jesse Plemons’ role as Post attorney, Roger Clark, are on point. The Post is a very good film with a cast of excellent players. It does become weighed down with some ‘speechifying’ at times which wasn’t really necessary. The entire film, based on history and fact, is its own important reminder of how a free press (and the wisdom of the courts) can serve there greater good. It is also an able reminder of just how fragile a free society is against the mistakes and unwarranted obfuscation of truth perpetrated by individuals in power-whether they are corrupt, or simply blinded by an ‘ends justify the means’ falsehood. The Post, shot on film, gets a lovely presentation on Blu-ray. Colors are nicely saturated (even with the more muted tones common to the 70s), black levels deep and without murk or other issues, and the level of detail is quite something. Flesh tones are natural, and all the period details, from light blue and brown/yellow tones in costume and decoration, are faithfully represented here. Framed at 1.85:1, the film was finished in 4K digital intermediary, showcasing longtime Spielberg Director of Photography collaborator Janusz Kaminski’s fine work (which has less of his more notable light manipulation on display than normal for him). This isn’t a flashy presentation, but it shows no flaws. For a relatively understated film audio-wise, The Post on Blu-ray manages to make its mark. John William’s quiet score (which wonderfully swells as the paper goes to print during an important scene), is pure Williams magic. The 7.1 DTS-HD Master Audio isn’t pushed that far, but the balance of dialogue and underscore is perfect. The surrounds are occasionally employed, such as during newsroom chatter and sequences during the Vietnam War. 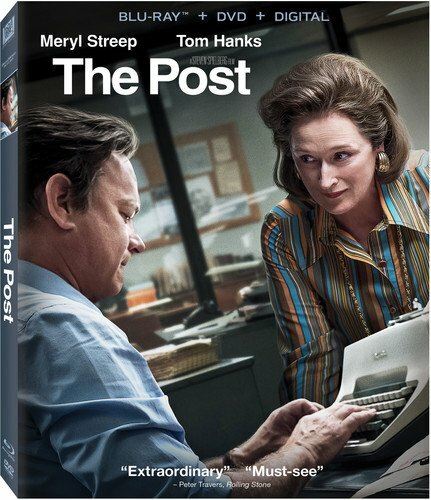 A foundational, but not quite deep enough collection of special features arrive with The Post. A reasonable surface look at the film. From the decision to make The Post, to release day, was an impossibly fast production. Yeah, I think they said that Spielberg came on right around the time of the Oscars so it took less than a year for the movie to come to fruition. And they started shooting on May 1, 2017 and it was in theater in under 8 months from that. You could even have a copy in your home in under a year from when they started shooting. That's amazingly fast for a modern day big budget Hollywood movie. Thanks, Neil M., for this perceptive and well written review. I'll probably pick this up at some point, as I really enjoyed it in the theater. I have to say with this film and Lincoln I really enjoy the combination of Spielberg and American historical drama. I would like to see him cover more of this kind of subject matter. Due to the fact he is Spielberg he gets everything he wants or needs to make these films and mounts a very handsome production. Thank you for this fine review of a film that was among my three favorite films of 2017.